From car accident attorney Steven Montag: If an accident is caused by a driver who did not have insurance it is called an uninsured claim and you will have to pay to repair or replace your car and pay for medical treatment yourself unless you have your own insurance to pay for the damages. Normally an insurance policy is the main asset that any driver would have to pay for the damages and costs after an accident. If a driver was not insured he or she probably has negligible assets. Although it is possible to sue a negligent driver who caused an accident for damages, it often will not lead to getting money from them. Even if you file a court case and win a court judgment, the at-fault driver may not have money to pay to you. That is usually how things work because people who have good paying jobs and assets like houses and cars normally get insurance that would protect them in the event that they cause an accident. Uninsured drivers do a lot of damage. Unfortunately, people who never bothered to learn to drive or who never got a driver’s license or insurance often share the road with us. Many people who have a history of drinking and driving do not stop driving just because they cannot get the insurance they would need to be responsible. You never know when a financially irresponsible and negligent driver will cross your path. The only thing you can do before an accident to prepare for being hit by an uninsured driver is to have good insurance of your own. The difference in cost between the state minimum liability policy and a higher coverage policy is not always very great. The difference in cost between a “full coverage” insurance policy and a minimum coverage liability insurance policy may not be very great. 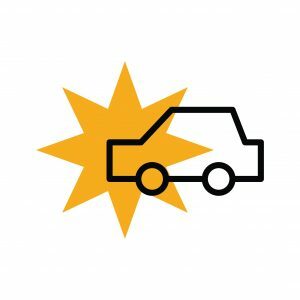 Collision coverage could pay for your car in an uninsured situation is not always expensive especially if you are driving an older car that does not have a loan. Make sure your insurance agent gives you options about coverage including higher liability limits as well as optional types of insurance such as collision coverage and medical payments coverage. Even if you have good insurance and drive a safe well-maintained vehicle and drive defensively you cannot control what the people do around you. Often it is good to leave your car in the place where it came to rest after the accident. That way the investigating officer can see what happened more easily from the position of your car and other physical evidence around it. Sometimes you have no choice about moving your car because it is not drivable. If it is safe where it landed, leave it there. However, if your car can be moved and it is not in a safe position initially after the accident, move it to a safer location close to the accident scene. Report the accident to the police as soon as possible. Have them come to the scene of the accident if at all possible. They can investigate the physical evidence as well as interview all witnesses and take your statement. Take notes about what happened while everything is still fresh in your mind. If you can give a good description of the at-fault driver and the other vehicle it will help when you talk to the police and when you fill out your own individual accident report. A “Driver’s Motor Vehicle Accident Report” is available through the police department or from the Nebraska Department of Roads. It is required to be completed by each driver any time an accident involves any injuries or if more than $1,000 of property damage occurs. Take picture of the accident scene, your own car, and your own injuries. Also, take pictures of the at-fault vehicle and the driver if possible. Also be aware of any close security cameras that may have captured pictures of the accident. Your insurance company must be informed of the accident promptly and you will need to cooperate with their investigation by making verbal and written statements and by submitting to physical examination and by making your car available for inspection. If you read this article before you have talked to your insurance company it is possible that we could help you organize your thoughts and prepare to deal with them. Attorney Steven Montag and the Montag Law office are available 7 days a week for free initial consultations. Just call (402) 334-2200 to discuss your situation. Weekend and evening calls are welcome. One of the things you need to be aware of in any uninsured situation is that your own insurance company is no longer completely on your side. Any money that is given to you for a settlement or court judgment will cost them. This is basically an unavoidable conflict of interest situation. Many people in this situation would benefit from the help of an experienced injury lawyer on their side.